Hamilton Gold purchases all types of silver bullion. 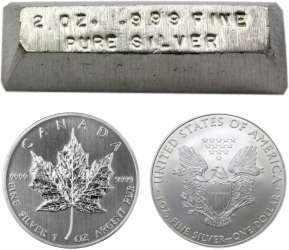 The prices that we pay for silver bullion depends largely on whether it is recognized or not. If bullion is produced from a recognized minting organization it can be easily resold and we are able to offer a higher price for it. Unrecognized bullion must be refined or sold off for a lower resale price, as a result, the payouts for these products are slightly lower.